There are plenty of compelling happenings to recommend PSFK’s home city, and this week’s crop is no exception: an innovation, content and music-focused festival, a unique presentation of New York journalism and a project that brings a smile—and a social (media) mission—to the subway grind. Northside, which kicks off today, is a five-day festival of innovation and music with events in venues across the Williamsburg, Greenpoint and Bushwick neighborhoods of Brooklyn. We’re looking forward to a vast lineup of panels on storytelling, AR, VR, advertising, creativity and design—and finally getting to hear, from Droga5 and MailChimp, the story behind that very strange campaign. For those who can’t attend, there will be plenty to enjoy remotely. The Northside Report, a subseries of the festival with a timely focus on journalism and politics (presented in partnership with The Intercept and BuzzFeed), will be live streamed on Facebook. And, should you find yourself in a Spotify rut, Northside’s concert schedule can double as ready-made list of what to play next. The haunting voice of Aldous Harding, who performs on Thursday at Park Church Co-Op and Saturday at Baby’s All Right, ranks high among the gems. Last weekend’s edition of The New York Times Magazine looked a little unusual: the entire issue (except for ads) was drawn by illustrators. 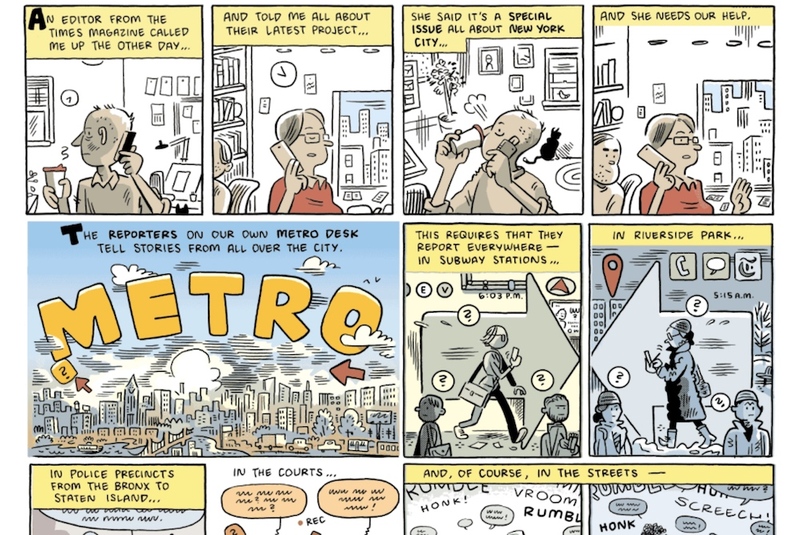 ‘New York Stories’ took some of the Metro section’s most memorable articles from over the years and adapted them into comics by various artists. It’s an example of how the newspaper is confronting the digital age with unexpected and eye-catching stunts. While the print version is especially delectable, the comics are also available online—complete with an animated header and UX-friendly layout. A group of guerrilla advertisers decided to celebrate Pride month on New York public transit with posters made to look like the MTA’s holiday service change notices. The posters, as well as rainbow flags adhered beneath the American flag on some subway cars, encourage New Yorkers to reject bigotry and join the ‘pride train.’ We’ll be keeping an eye out for them during our commutes but, thankfully, social media is here to help locals share the project far and wide on Instagram at @pridetrain and #pridetrain.